In the last paragraph, I think you mean the LHC's initial state IS symmetric (i.e. protons on protons). Depends which symmetry :-). But, sure, it was unclear, corrected. Top quark pair production in p p collisions is a sensitive probe of QCD at high energies. SM predicts that quark pair production is symmetric under charge conjugation, at least to the lowest order. If the result holds or it is enhanced at LHC, it may signal the breakdown of SM and the onset of a strongly asymmetric regime in charge conjugation. I was thinking on some superpartner of the gauge bosons, amazingly surviving almost unbroken at EW energies, but probably it is already discarded by other limits. Anyway, does it need to be a integer spin particle? I'm a little confused why the asymmetry is non-zero in QCD. If QCD respects C and P then why would the tops go preferentially in the direction of the proton? At the Tevatron, the initial state is not C or P symmetric, which introduces the preferred direction. Arvind R. has pointed out to me that the total cross section looks really OK and constrained - while a new particle would enhance it. I don't think the KK gluon is the only possibility. See for example 0911.3237 where they show that a colored scalar triplet or sextet in the t-channel can also give a large asymmetry without screwing up the top production cross section. So it can even be an R-parity and flavor violating squark. Alejandro, light particles interfering with the top production are strongly constrained by the top cross section measurements, especially by dσ/dm_tt. Not sure how you want to mix fermions into that. Jester, I was thinking mainly in the octet of gluinos. But the limits for them should be already about 400 GeV, even if you can imagine a way for them to enter play. Yep, the KK gluon is an interesting answer too. I'm a bit puzzled by how a KK gluon can have axial couplings to the top and light quarks, which moreover have opposite sign for the top and light quarks, since QCD preserves parity - so I would have thought KK gluons would only have parity conserving couplings. What channel would the KK gluon be in? Is there a simple way to understand how the KK gluon can produce an asymmetry that increases with the t t bar mass, without affecting the production cross section? In the Randall-Sundrum model KK gluon can have different couplings to left and right quarks, because in general the quarks can be differently localized in the extra dimension. So that's ok. In the CDF paper an off-shell heavy gluon enters in the s-channel, q qbar > G > t tbar. The top cross section does get modified, but experimental and theoretical uncertainties are presumably still large enough to accommodate the shift. But don't get too attached to the idea, nobody says it's a KK gluon. Uncle Al, that's brilliant! Thanks. On other hand, the most stressed measure in the LEP, at 2.3 sigmas, was the FB asymmetry for bottom production (here page 27 and details here). Given that the production here is not QCD but EW decay, it is not easy to think of a common physics, but perhaps a common systematic problem, either in detectors or in calculation?? Or is there a possible common physics, at all? Thanks, Jester, that's absolutely fascinating. I think now it might also be able to occur in models like my arXiv:0704.1476, and the requirement that it be possible is quite constraining - look for my contribution to the 123 within the next few days, with a bit of luck. Alejandro, thanks for pointing this out. If the left-handed q, u, and d multiplets can be located at different regions in the extra dimensions, so that a KK gluon, whose wavefunction depends on position in the extra dimensions, can couple to them with different strengths, then so can the left-handed l and e, and KK Z and W, whose masses and wavefunctions will be the same as the KK gluon's before electroweak breaking, can also couple to the SM chiral fermions with different strengths. I am somewhat surprised how people go around looking for exotic explanations. I am convinced that here there is a more prosaic reason for this and a proper NJL model could fit the bill. NJL model? If you refer to the toy models treating QCD, that sounds extremely unlikely. These processes are very high energy, the realm of quarks and gluons. TGD predicts that all gauge bosons should be accompanied by scalars and pseudo-scalars with same quantum numbers: also gluons. Scalars should be eaten to give the third polarization to gauge bosons. Could the coupling to a pseudo-scalar variant of color octet Higgs give rise to a contribution interfering with the contribution of spin zero virtual gluons and in this manner give rise to the asymmetry? See this. Maybe there is simple objection but I am not able to invent it now. NJL model are not toy models. Rather, they apply to the low-energy limit of QCD. But in this case we are in a fully asymptotic freedom regime where one should expect gluons to be massless. This is the more tricky aspect of this result. Observing a "massive gluon" of 450 GeV seems to be in the higher end of the spectrum of Yang-Mills theory for a massive gluon (mass gap plus excited states without no bound from above). 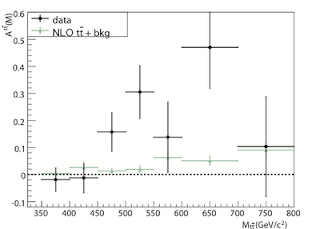 KK gluons seem a rather interesting possibility but they imply a higher mass being O(TeV) and some other problems. This makes this finding at Tevatron really striking. NJL models are toy models, which describe certain aspects of low energy QCD. They are toy models because they do so in terms of both mesons and constituent quarks, and there is experimental evidence that there is no energy regime in which an effective theory containing both describes the physics at anything more than the qualitative level. This different than perturbative QCD at high energies or chiral perturbation theory at low energies, both which describe the physics very well. But the basic point is that NJL models do not even pretend to describe physics beyond 1 GeV. They simply have nothing at all to say about the energies at which top quarks are produced. Scalars with a variety of color representations (singlet, octet, sextet, triplet) have been tried; see 0911.3237 , which Jester already alluded to. The conclusions of those authors are that singlets and octets do not produce the right asymmetry, but sextets or triplets could for some couplings. Is the Tau Lepton similarly asymmetric ? Tau has chiral coupling to Z, so there is an asymmetry. It was measured at LEP and it agrees with the Standard Model. Oh, come on, people. Obviously we are seeing the color carried by the Z boson under the twisted Fourier transform of the Bilson-Thompson fermion braid spectrum. 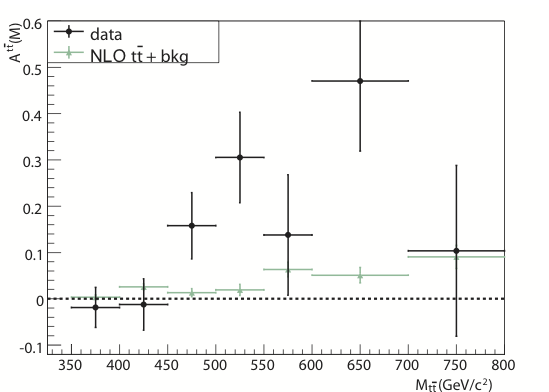 Of course, we have in mind different NJL models as it can be proved that, at low energies below 1 GeV as you correctly states, a NJL model is the correct low-energy limit of QCD using just quarks and a proper propagator for the gluon field. So, while I can realize that my initial comment was not so clear, I should say that your knowledge of NJL models is just old-fashioned. What I am saying is something different. My take is that the spectrum of Yang-Mills theory (this is a black box for physics so far) can explain the t-tbar asymmetry. You can of course use the term NJL however you like. But you will run into misunderstandings right and left. As commonly used, NJL refers to the work of Nambu and Jona-Lasinio and very much applies to low energy QCD. There are applications of NJL-type dynamics to physics beyond the standard model, such as in top condensation and its descendants such as top-color. It would be interesting to see if they have anything to see here, but it is not at all obvious a viable scenario which is in agreement with other data is permitted. However, I think it is very sloppy notation to call the low energy dynamics of a "random" Yang-Mills theory a NJL model; rather NJL captures some features of certain kinds of Yang-Mills models. My take is that Yang-Mills theory has a mass gap and a set of excited states not bounded from above. This means that one could in principle get massive glue state excitations also at very high energies like in this case producing a possible asymmetry. Actually, I was the one who said low energy QCD is an NJL model. I am glad you now agree. And for the record, that body of work goes back to the original work by Nambu and Jona_Lasinio. Those papers were referenced in Nambu's Nobel prize award text. You should explore Yang Mills theories which you think could produce this effect. I think building realistic models will be challenging, but it is an interesting idea. I am not sure there is an immediately obvious explanation of this FB asymmetry. 1) is it a pure high-energy QCD effect from the q-qbar->t-tbar channel? 2) is it an electroweak effect from the top decay t-> W-b? 3) is it a combination of 1) and 2)? 4) is it a "beyond the Standard Model" effect that can be attributed, for example, to the dynamics of Yang-Mills fields sliding outside equilibrium?